NASHVILLE, Tenn.—Kicking-off last week in California, the landmark “Newsboys United Tour” saw sellout crowds throughout the opening weekend. Boasting "all the hits... under one roof... for one tour," the history-making Newsboys United lineup played to capacity audiences at City National Civic in San Jose, Redding Civic Auditorium and the Visalia Convention Center, as well as to a near-sellout crowd at Stockton’s Bob Hope Theatre. Produced by Premier Productions in partnership with the Newsboys, the tour is set to visit more than 30 additional cities across the nation, including Houston, Minneapolis, Dallas and Orlando, Florida, before wrapping May 6. The “Newsboys United Tour” features special guest Word recording artist Zealand, which is founded and fronted by Phil Joel. 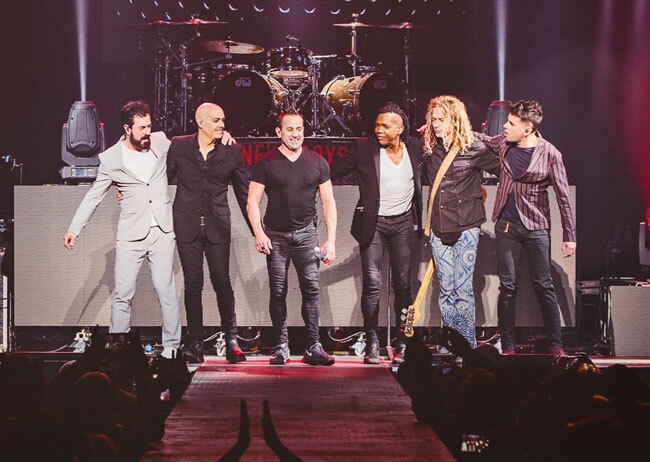 One of the most influential bands in Christian music history, Newsboys have sold more than 8 million units and amassed eight Gold® certifications, 33 #1 radio hits, four GRAMMY® nominations, two American Music Award nominations and multiple Dove Awards. Comprised of Michael Tait (lead vocals), Jody Davis (guitar), Jeff Frankenstein (keys) and Duncan Phillips (drums), Newsboys’ signature songs include “We Believe,” “He Reigns,” “Miracles” “Born Again” and their Platinum®-certified mega hit, “God’s Not Dead.” The latter inspired one of the most popular Christian film franchises of all time, PureFlix’s God’s Not Dead and God’s Not Dead 2, both of which included appearances by the band. God's Not Dead - A Light In Darkness hits theaters across the country March 30. For more info on Newsboys, visit the JFH Artists Database.